At the Home for Wayward and Misbegotten Creatures the part animal-part human Groundlings, are controlled and forced to ‘serve and suffer’. Miss Carbunkle, the hairless, vicious owner of the Home with a penchant for tiered wigs, forbids any pleasure, particularly singing and music. She has a magic cane, and an agenda of her own for which she would go to any lengths, to see realized. One-eared, Number Thirteen is the only Groundling without a name. An innocent half fox, half boy, and small in stature, he was abandoned soon after birth at the Home. A small key wrapped in a scrap of blanket is the only evidence of his past life. When he saves the wingless bird Trinket from bullies, she names him Arthur, after the brave and legendary King. Empathy is felt immediately for these specific characters. At last Arthur has a name, and a friend. He also has secret gifts. He can hear sounds from far away, understand animals when they speak, and he sings in his sleep. Trinket is a storyteller. The stories she shares with Arthur fill him with wonder. She constructs mechanical wings from scraps and hatches a plan of escape for Arthur and herself. The idea is born in Arthur that he may have a family somewhere in the world outside. Was it possible that he could find where he came from, who he was, and what he was here for? Could he have a destiny? In stunning prose, set in three parts, we accompany the two friends on their journey out of the Home, and meet the most surprising characters. When Trinket finds family, Arthur continues alone on his odyssey to discover his destiny. He also discovers the Songcatcher, which is the secret link to his past. Sacrifices are made. Help comes in strange and unexpected forms. He learns to ‘be brave, and never, ever lose hope’. The characters are Dickensian, with allusions to the Victorian steampunk era. Miss Carbunkle recalls the image of Miss Trunchbull in Roald Dahl’s Matilda. The interweaving of all these contribute significantly to this startlingly beautiful novel. Mira Bartok’s spectacular scenes prove she is a ‘visual thinker’. A gifted artist, musician, and writer, she uses these gifts to illuminate the gripping plot twists and turns, and every surprise happening in this epic journey of self-discovery and finding a place to belong. There is a strong accent on wonder throughout the book. 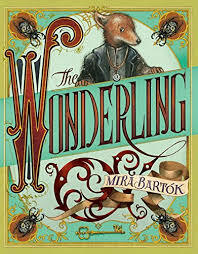 With a motion picture already underway, this first novel of Bartok’s for younger readers is impressive. Her exquisite artwork is mind-blowing. The book is divine in every way. The excitement surrounding its release is well deserved.